The US has been spying on German Chancellor Angela Merkel’s mobile phone since 2002, according to a report in Der Spiegel magazine. The German publication claims to have seen secret documents from the National Security Agency which show Mrs Merkel’s number on a list dating from 2002 – before she became chancellor. Another report says Mr Obama was told in 2010 about the surveillance. Meanwhile Washington has seen a protest against the NSA’s spying programme. Several thousand protesters marched to the US Capitol to demand a limit to the surveillance. Some of them held banners in support of the fugitive former contractor Edward Snowden, who revealed the extent of the NSA’s activities. 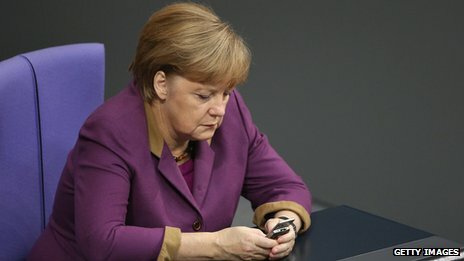 The nature of the monitoring of Mrs Merkel’s mobile phone is not clear from the files, Der Spiegel says. For example, it is possible that the chancellor’s conversations were recorded, or that her contacts were simply assessed. Germany is sending its top intelligence chiefs to Washington in the coming week to “push forward” an investigation into the spying allegations, which have caused outrage in Germany. “Obama did not halt the operation but rather let it continue,” the newspaper quoted a senior NSA official as saying. As well as the bugging of Mrs Merkel’s phone, there are claims the NSA has monitored millions of telephone calls made by German and French citizens. This scandal has caused the biggest diplomatic rift between Germany and the US in living memory. A close ally of Mrs Merkel told the BBC that she was personally very hurt by the idea of being spied on by American friends. The chancellor is said to be shocked that Washington may have engaged in the sort of spying that she had to deal with while growing up in Communist East Germany. The documents seen by Der Spiegel give further details of the NSA’s targeting of European governments. 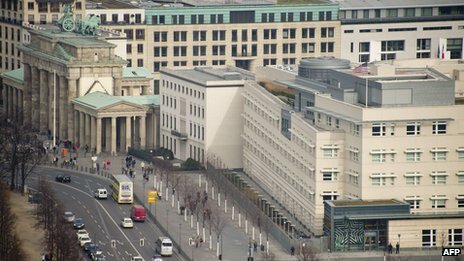 A unit called Special Collection Services, based on the fourth floor of the US embassy in Pariser Platz in Berlin, was responsible for monitoring communications in the German capital’s government quarter, including those targeting Mrs Merkel. Germany’s Interior Minister Hans-Peter Friedrich told Bild that running such an operation on German soil would be illegal under German law, and adds that those “responsible must be held accountable”. A criminal investigation would take the current scandal out of the hands of diplomats and politicians, and so make it harder to control politically, says the BBC’s Steve Evans in Berlin. If the existence of listening stations in US embassies were known, there would be “severe damage for the US’s relations with a foreign government,” the documents said. The US government had a second German spy base in Frankfurt am Main, the magazine reports. The scandal has caused the biggest diplomatic rift between Germany and the US in living memory, reports the BBC’s Damien McGuinness in Berlin. Mrs Merkel – an Americophile who was awarded the US Presidential Medal of Freedom in 2011 – is said to be shocked that Washington may have engaged in the sort of spying she had to endure growing up in Communist East Germany.